We've recently released a new downloadable digital collage sheet design featuring charming children and lovely ladies (and turkeys!) from vintage postcards, some by Ellen Clapsaddle and Frances Brundage. Enjoy these for your harvest time and Thanksgiving crafts: card making, decorations, tags, candle labels, etc! 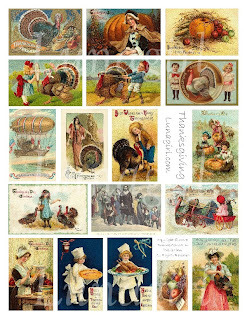 Click the picture to find it on our website ready for download (you'll also find several beautiful collage sheet designs featuring Victorian Christmas cards and ephemera).